Yes, you do. Maybe you are mixing EY up with EK? EK restricts chauffeur-drive only to those tickets issued by EK or QF (so AS miles users are out of luck). I’ve got the chauffeur on both arrival and departure from AUH using AA miles. This was last month, booked some time in summer. Line removed, as per my comments in the other Etihad article! Looks stunning, I am SO excited for our flight in feb! By the way, I booked with AA miles and have prebooked the chauffeur both ways no problem (the return is direct to Manchester in business). Anyway, the value you get for the AA miles in particular is unbelievable, buy the miles now in the promotion and book yourself a cheap jolly on this, I doubt you will regret it! Out of interest, how many miles should I buy and how much would this cost me? 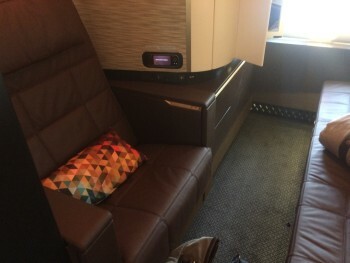 Does anybody knows how American/Etihad charge for lap infant on this? I have enough miles to book First class for me and my wife but not idea how they will treat my 8 months old baby. Thanks. It’s been 3 years since I did this, so forgive me if I’m wrong. But I think AA insist on charging 10% of full fare for the baby. It may be easier to book yourself a ticket using a miles. And mother and baby a ticket using etihad points, I think that’s what I did. I booked with Etihad miles before baby was born, having been told that I could book the baby once he was born. Now they refuse to let me book with miles for the toddler and are insisting I pay cash. 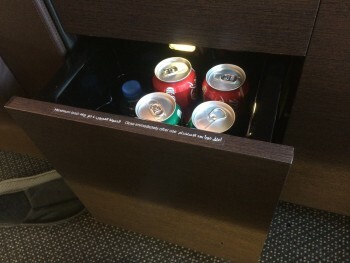 I believe Etihad infant fares are actually 15%. And the subset of fares AA can book is limited so it’s 15% of a very big number. I gave up on the idea! AA charged me 10% miles for the infant seat last year. AA call center rep generated the PNR for 2 adults and then asked me to call Etihad UK to generate a separate ticket for the infant and then link the infant ticket PNR to my PNR. Etihad told me to ask AA to generate the infant ticket but eventually I got it done through Etihad. They charged me 80£ for a London Bombay return reward flight for business class. Even post devaluation, at 62.5k AAdvantage miles, that’s still quite a steal for the Apartment. Plus, you can maximise that, because the 62.5k zone includes the Indian Subcontinent. So anyone heading for Mumbai, for example, a route which will also have the A380 rostered on, could get great value out of the award. 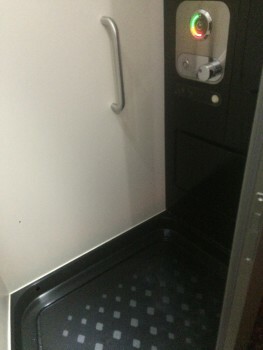 Can you transit in the Middle East on Etihad or is it only Qantas they allow this? AA has very odd routing rules and they do NOT publish them! Yeh you can. 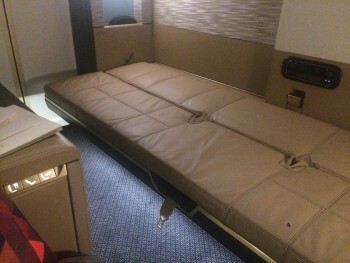 I just got return to Mumbai all in a380 for 80K AA miles. Overnight transit in both directions. Can you stop-over in AUH on that 62.5k redemption? No, AA will have to price it as two separate legs, each priced independently off the redemption chart. Not sure if there are routing rules to apply to Etihad redemptions (via AA) — as long as you are paying miles off the published chart for each segment, they are happy. 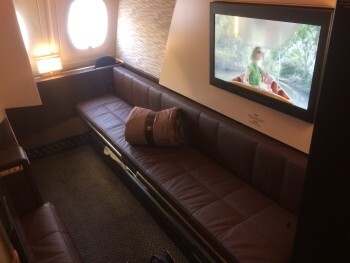 We flew this for the first time back in August, then a week later flew BA F, which was the first time my girlfriend had ever flown BA F. This was pre Jennifer Aniston’s Emirates advert, and she walked up to one of the BA crew and asked her where the bar was, then looked so disappointed at the answer. Since then we have flown it twice more and will fly it and their B787 again on the way back from Singapore in a few weeks. I will agree that there are points to complain about (most of them actually related to what your next article on food/service will likely cover), but as a hard product it is quite phenomenal. Agree with comments, but it just goes to show the huge variations in product between different airlines and how most people assume that what one airline does that the others also do. But all said, BA First was excellent for me, made even better by the cabin crew (turns out they lived nearby to me, which helps!). I’d contrast that with Emirates who have a great hard product but, in my experience, rather robotic cabin crew who don’t like deviation from standard protocol, even in business, or manage to take your food order wrongly. When the BA cabin stewardess said to my partner ‘not to worry, i’ll be mother on the flight’ i didn’t know what to think (!) other than you wouldn’t get that with another airline. We had a great crews on BA F on both our outbound flight to NRT this October and return from HKG. The time,effort,care and attention offered by them was superb and could not be faulted. All ready looking at 2-4-1 BA F long haul trips with 10 hours flying plus and hopefully a 787-9 F Class flight. This looks amazing but personally I don’t have any desire to visit the Middle East. How many more miles maybe somewhere in the Far East? Lol did you miss the reading light rob? It is high up above where the remote is. Press it to make it pop out and it automatically comes on. It is about the size of a 5p coin and does not illuminate a newspaper! 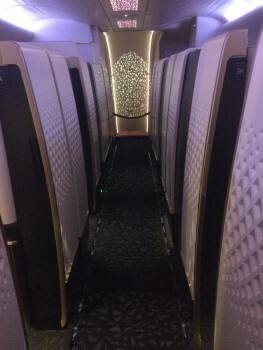 I managed to purchase an upgrade to a suite for £700 for my dads recent flight to Australia. He said it was fantastic! Ah, Mark, I see you have answered one of my questions re connecting doors in my post below. Sounds much better. Not really. It slides down, but only a small part of the suite. You can see your partner and have a part of the bed that is attached, but it’s certainly not a double bed in a traditional sense. I’m sure it’s just me being weird but it all looks a bit lonely and somehow soulless. Don’t get me wrong, I’d love to give it a try someday, but “people watching” on a plane is all part of the fun for me and with this product that element appears to be lacking somewhat! I guess if you want company then head to the bar, eh. Plus if you’re travelling as a family I presume you have a suite each; I don’t suppose they have connecting doors do they like hotel rooms? I agree – that’s why I never close the doors. On the other hand, on my Qatar F flight the guy sat next to me decided to watch videos on his mobile phone WITHOUT headphones for much of the flight ….. wouldn’t have minded being a few feet further away then! You didn’t say anything? Or get the stewardesses to? It was the crew who encouraged me to move to a suite with a seat by the window because the light was so low. It is only helped for an hour, however, until it got dark outside! It’s not just you. I think it looks utterly depressing. I don’t really understand the obsession with total privacy on a plane – altho I may have resorted to physical violence with the bloke sat next to Rob on Qatar. Looks great. If Etihad ever get rid of the 2 year expiration date on miles I will definitely use them. OT – Have just booked flights to Miami using 190k miles and 2 x 241 vouchers for next year. Slightly better dates have opened up overnight, in same cabins both ways. How easy is it to move the flight dates? Can I call up and do it? Or do I need to cancel and start again, which I am loathe to do in case I miss them and then lose my original flights?? any thoughts please…. Call. It is a doddle, you keep the same booking reference and the whole process takes under 5 minutes. 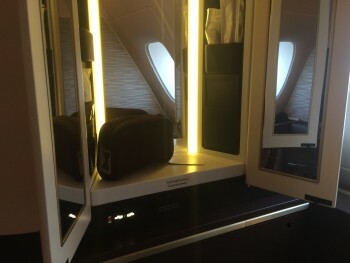 I hope the transfer is included with AA bookings, it does show on my booking for AUH-SYD in April. For those looking at the taxes booking with AA 60,000 miles and £29.30 per person. Just hoping the 380 is not swapped for the 777. It seems I was mistaken on this one! I only have enough AA miles to book one way. I will be flying the other leg from/to DXB on BA with an avios redemption. Which is the best way to combine these flights? EY F outbound or return? 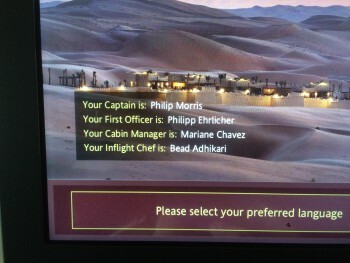 I am thinking BA on the way out and return on EY F to experience the AUH lounge. The EY F lounge in Abu Dhabi is STILL not finished. Given that the new terminal opens in 2017 you now need to question whether it will open. Until this opens I doubt it makes much difference. BA will have a brand new lounge in the brand new Dubai Concourse D very soon so both airlines will have decent facilities at both airports.